"The apple and onion together work magic on this classic dish. This is traditionally served on New Year's Day in Central Pennsylvania. It is customarily served with mashed potatoes. The sauerkraut mixture tops the mashed potatoes like a gravy. Surprisingly good." Heat a large skillet over medium-high heat. Brown pork chops in hot skillet, 2 to 3 minutes per side. Drain. Arrange apples and onion in the bottom of a slow cooker; top with browned pork chops. Pour in enough water to cover bottom of the slow cooker crock. Cook on High for 3 hours (or on Low for 6 hours). Add sauerkraut and fennel seed to pork chop mixture. Cook for 1 more hour. What's cooking in Nashville? 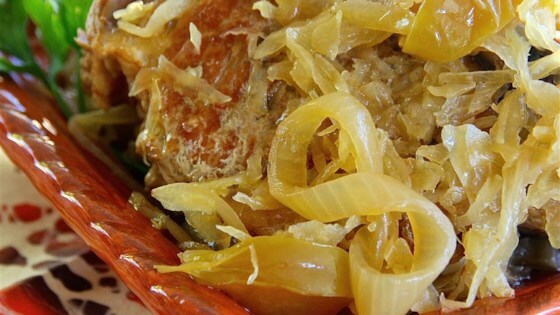 Jamie's sweet, tender sauerkraut and pork loin. Caraway seed can be substituted for fennel seed. Loved it! The pork chops were so tender and the apples were a good contrast to the sauerkraut. loved it! the most tender pork chop I've ever made. I only had two pork chops so I just cut down on the other ingredients and it turned out great.